Symbols*: The surfacing carp symbolize emotional renewal after filtering muddied waters of confusion. 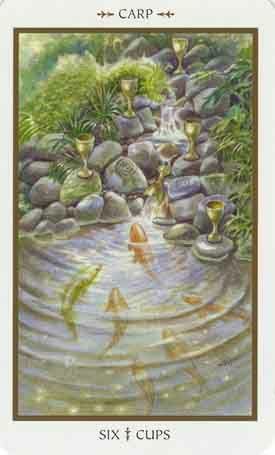 A golden cup spills fresh liquid into the rippling pond and rejuvenates the waters with its cleansing properties. The positioning of the other cups symbolizes the fidderent levels of spiritual achievement and reminds us that it is important to stay connected with the various facets of our being. The fish wade in the spiritual essence of the fresh water, signifying purification of the soul. The lush greenery surrounding the water represents prosperity, fertility, and a time for rejuvenation. The spirals on the stones border the fresh cascading water and are reminders of the need to purge and start fresh after encountering difficult situations. Description*: The fish are surfacing from the deep pools of our psyche. Their emerging presence offers a reminder that it is important to look within and see those aspects of our inner being that require attention and healing. If we relegate painful emotions to the deep unconscious, they may surface in ways that are detrimental to our well-being. By allowing ourselves to open up to the deep-seated emotions residing in our psyches, we can learn to channel that energy in a manner that will allow us to experience personal renewal and elevated confidence. Possible Meaning: These small fish are approaching the top of the water, nearly reaching for the cups. They remind you to look within and see those aspects of your inner being that require attention and healing. This is a time of renewal and pleasure after overcoming a period of emotional insecurity and challenges. In Chinese culture, koi or carp means abundance. Thoughts/Points to Ponder: These small creatures coming out of the water are adorable. I don’t want to harm them as I feel that they are here to help me heal my wounds, my past, overcoming the challenges or difficulties I have faced in my life. They are a beautiful reminder of greater good, and things happening for a reason. Thank you for the lessons learned. The Koi or Carp Fish represents wealth and prosperity, as the actual word in Chinese for fish translates into "abundance". The Carp is especially celebrated for its strength and bravery; as it is said to live for over 100 years and continuously swims upstream, against the currents and fights adversity throughout its entire life. Goldfish – Prosperity, beauty, harmony, balance of mind and emotion. Goldfish will help you look for new opportunities and aid you in taking advantage of them.